Any user who logs in to iCloud.com will find browser-based beta versions of Pages, Numbers and Keynote  Apple's iWork suite  are now available to test. Apple has been gradually rolling out iWork availability, first to developers and then to some select users. But now, as of Friday, any user with an Apple ID who logs into the iCloud.com website should have access to Pages, Numbers and Keynote. 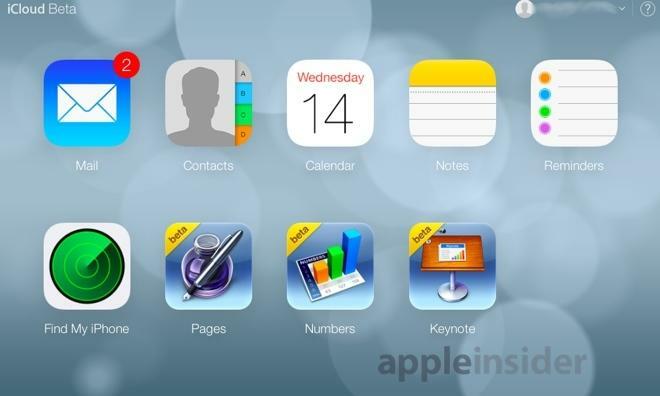 The iWork apps join Mail, Contacts, Calendar, Notes, Reminders, and Find My iPhone as free cloud-based offerings from Apple. All three iWork apps are clearly labeled as "beta" with a yellow banner in the icons' upper left corners. The service was first announced at Apple's Worldwide Developers Conference in June, and works with Safari, Chrome and Internet Explorer. It allows users to quickly access, edit and save their documents from the Internet. Not yet available to all users is the new look for iCloud.com in line with iOS 7, matching the redesigned icons that are found in beta versions of Apple's iPhone and iPad software. iOS 7 is expected to launch to the public next month, but no timeframe for the new iCloud.com site has been given.